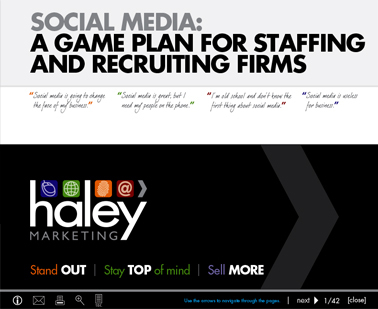 At this Lunch with Haley webinar we are going to address the big things you need to do--and the bad advice many staffing firms are getting--about mobile marketing and recruiting. Recently, we've given you a game plan for social media, and outlined the steps to use social media for recruiting and lead generation. Today, we're providing you with the ultimate comprehensive guide to social media. This free, 50-page eBook details why you should care about social media and gives you specific, easy-to-implement tactics for a successful social media strategy. Lowering prices in staffing is a mistake...right? Ask Haley: Why isn't my location showing up in search engines with the right address? I hope you enjoy the eBook, and if you have questions about your social media strategy, call us at 888.696.2900. We'd love to help! Join our Ask Haley Group on LinkedIn! Be part of the ONLY group on LinkedIn dedicated to issues about sales and marketing for staffing.